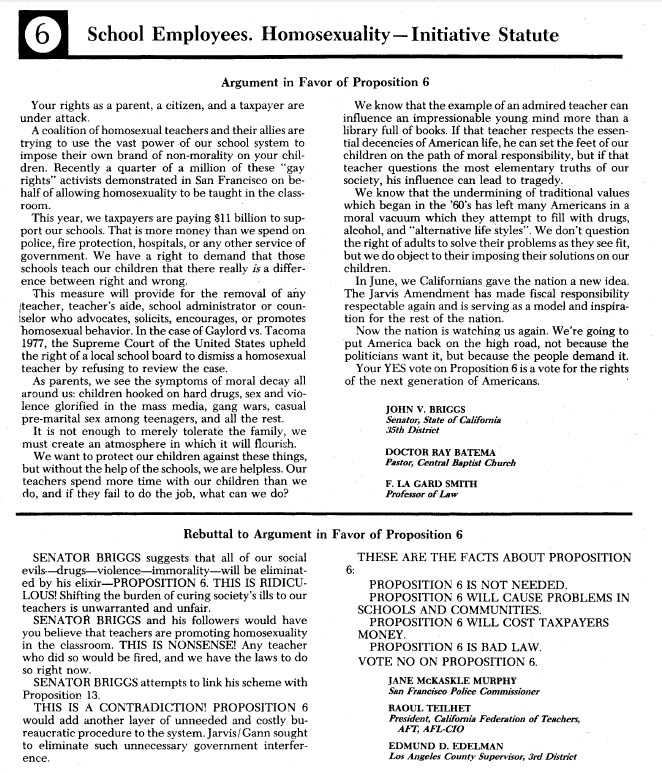 California Proposition 6 (1978)–Briggs Initiative. Proposal to ban gays and lesbians from being teachers. Ballot summary & arguments. The proposition was defeated. Bob Jones University is a nonprofit corporation located in Greenville, S.C. Its purpose is “to conduct an institution of learning . . giving special emphasis to the Christian religion and the ethics revealed in the Holy Scriptures.” . . . Bob Jones University is not affiliated with any religious denomination, but is dedicated to the teaching and propagation of its fundamentalist Christian religious beliefs. It is both a religious and educational institution. Its teachers are required to be devout Christians, and all courses at the University are taught according to the Bible. Entering students are screened as to their religious beliefs, and their public and private conduct is strictly regulated by standards promulgated by University authorities. There is to be no interracial dating. 1. Students who are partners in an interracial marriage will be expelled. 2. Students who are members of or affiliated with any group or organization which holds as one of its goals or advocates interracial marriage will be expelled. 3. Students who date outside of their own race will be expelled. 4. Students who espouse, promote, or encourage others to violate the University’s dating rules and regulations will be expelled. There can thus be no question that the interpretation of § 170 and § 501(c)(3) announced by the IRS in 1970 was correct. That it may be seen as belated does not undermine its soundness. 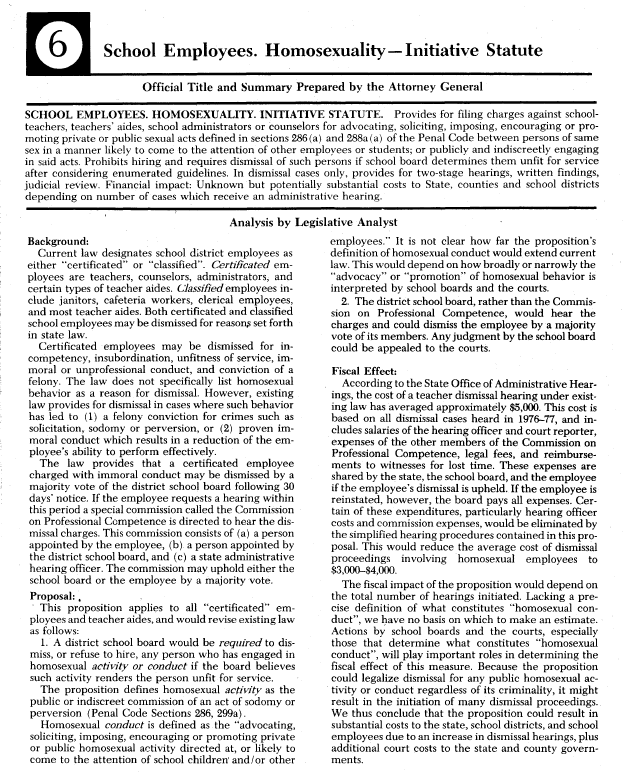 It would be wholly incompatible with the concepts underlying tax exemption to grant the benefit of tax-exempt status to racially discriminatory educational entities, which “exer[t] a pervasive influence on the entire educational process.” Whatever may be the rationale for such private schools’ policies, and however sincere the rationale may be, racial discrimination in education is contrary to public policy. Racially discriminatory educational institutions cannot be viewed as conferring a public benefit within the “charitable” concept discussed earlier,[p596] or within the congressional intent underlying § 170 and § 501(c)(3). Petitioners contend that, even if the Commissioner’s policy is valid as to nonreligious private schools, that policy cannot constitutionally be applied to schools that engage in racial discrimination on the basis of sincerely held religious beliefs. As to such schools, it is argued that the IRS construction of § 170 and § 501(c)(3) violates their free exercise rights under the Religion Clauses of the First Amendment. This contention presents claims not heretofore considered by this Court in precisely this context. This Court has long held the Free Exercise Clause of the First Amendment to be an absolute prohibition against governmental regulation of religious beliefs . . .
On occasion, this Court has found certain governmental interests so compelling as to allow even regulations prohibiting religiously based conduct. In Prince v. Massachusetts, 321 U.S. 158 (1944), for example, the Court held that neutrally cast child labor laws prohibiting sale of printed materials on public streets could be applied to prohibit children from dispensing religious literature. The Court found no constitutional infirmity in “excluding [Jehovah’s Witness children] from doing there what no other children may do.” Id. at 171. Denial of tax benefits will inevitably have a substantial impact on the operation of private religious schools, but will not prevent those schools from observing their religious tenets. The governmental interest at stake here is compelling. As discussed in Part II-B,supra, the Government has a fundamental, overriding interest in eradicating racial discrimination in education — discrimination that prevailed, with official approval, for the first 165 years of this Nation’s constitutional history. That governmental interest substantially outweighs whatever burden denial of tax benefits places on petitioners’ exercise of their religious beliefs. The interests asserted by petitioners cannot be accommodated with that compelling governmental interest, see United States v. Lee, supra, at 259-260; and no “less restrictive means,” see Thomas v. Review Board of Indiana Employment Security Div., supra, at 718, are available to achieve the governmental interest. The Court points out that there is a strong national policy in this country against racial discrimination. To the extent that the Court states that Congress, in furtherance of this policy, could deny tax-exempt status to educational institutions that promote racial discrimination, I readily agree. But, unlike the Court, I am convinced that Congress simply has failed to take this action and, as this Court has said over and over again, regardless of our view on the propriety of Congress’ failure to legislate, we are not constitutionally empowered to act for it. I have no disagreement with the Court’s finding that there is a strong national policy in this country opposed to racial discrimination. I agree with the Court that Congress has the power to further this policy by denying § 501(c)(3) status to organizations that practice racial discrimination. But as of yet, Congress has failed to do so. Whatever the reasons for the failure, this Court should not legislate for Congress. Petitioners are each organized for the “instruction or training of the individual for the purpose of improving or developing his capabilities,” and thus are organized for “educational purposes” within the meaning of § 501(c)(3). Petitioners’ nonprofit status is uncontested. There is no indication that either petitioner has been involved in lobbying activities or political campaigns. Therefore, it is my view that, unless and until Congress affirmatively amends § 501(c)(3) to require more, the IRS is without authority to deny petitioners § 501(c)(3) status. For this reason, I would reverse the Court of Appeals.